With cash machines on every corner and most shops accepting card payments, we’re now spending more and more money without ever looking at our bank balances. This can making saving money very difficult and all too often there’s not enough money left at the end of the month. 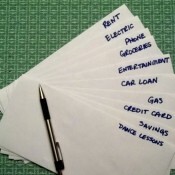 Using envelopes is a classic method to keep a physical track of how much money you have. Just like a normal budgeting system, first divide up how much money there is to spend each month into different categories such as groceries, utilities, car costs, etc. Each category then gets its own envelope in which you put the cash amount budgeted. By only taking cash out of its appropriate envelope when needed, you can stay easily on top of your budget. Envelopes help visualise a money saving objective, whether it be getting out of debt, replacing or buying home appliances or taking a much needed vacation. Break out the pen and paper and do some number crunching. Remember to include all monthly payments when doing a budget, including any phone and electricity bills or direct debits that you may have forgotten about. Even though these payments may get paid straight from your bank account automatically, I would still recommend making an envelope for these payments and either leaving it empty or putting a cheque inside for a visual reminder. The key to managing your finances well is willpower. Don’t stray from your budget and withdraw extra cash from the bank unless it’s an emergency. Write the amount each envelope contains on the back, and every time you take cash out don’t forget to note it down. Otherwise, the next time you open your grocery shopping envelope, you may find out that what you thought was an envelope full of twenty pound notes in fact only contains fivers! Always put larger notes in the envelopes to help dissuade temptation. Now you can ask yourself, ‘do I need it, can I afford it, and is it worth breaking a note for?’ I personally feel a lot less tempted to break that twenty pound note when all I’m buying is a chocolate bar.